Lets the already compact OneWash take up even less space in your garage or shed during storage. Makes it easy to transport, too. Integrated 3/4 gallon tank with drain plug provides convenient onboard storage for cleaning detergents. Can be quickly emptied and cleaned with a garden hose. The new OneWash™ from Generac. It’s four pressure washers in one. The OneWash features the largest, most powerful engine in its class. And the innovative PowerDial™ provides total control at the turn of a dial, so you can easily adjust the intensity of the spray to clean a wide range of surfaces, all with a single, easy-to-use control. 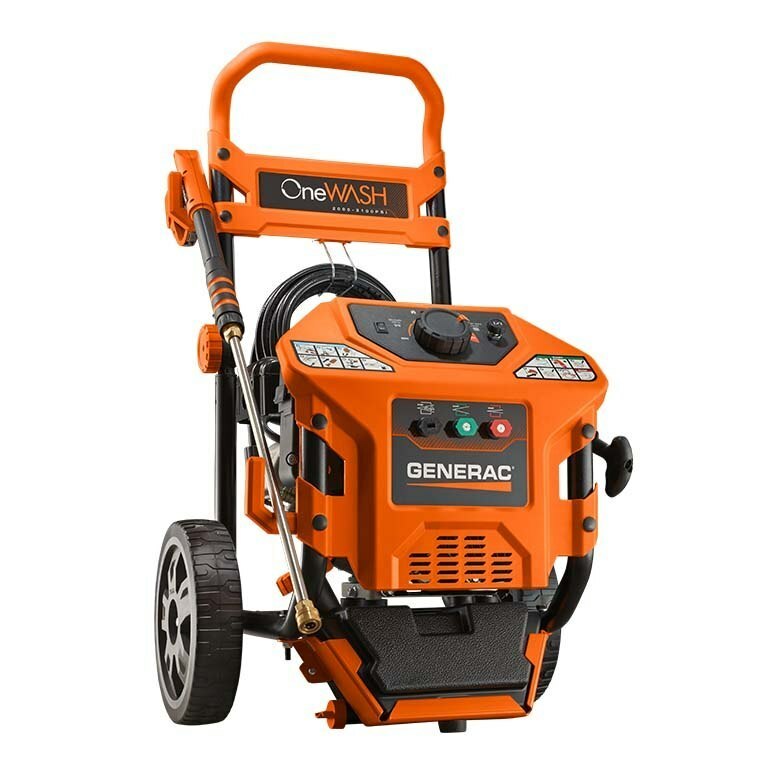 Explore the versatility and power of Generac's One Wash pressure washer. The unique Power Dial allows you to select the output pressure for your specific cleaning job ... making it like four pressure washers in one. Whether you're washing the driveway or prepping for a painting job, you need the right tool. Enter Generac pressire washers. Our customer research led us to engineer our pressure washers from the ground up, to meet your specific needs. Rated 4 out of 5 by rex450se from Obsessed Auto Detailer I've been looking for a pressure washer for awhile now and had done quite a bit of research. In the sub $500 range this was the only one I could find that you could adjust the pressure on without using different nozzles to achieve it. Assembly was fairly easy and it seems fairly well built. Most of the home pressure washers have a lot of cheap feeling plastic and almost seem toy like and this one is no different. I've used it a few times and just completed the first oil change at about 5 hours of use. As with any of the other machines the hose that comes with them is cheap and short so I've bought a longer and better quality one to use, but that's no knock on this one, as it's what they all seem to come with. The wand is of real good quality and I'd say better than comes with most machines in this price range. The only option this doesn't have that a couple of the competitors have that I wish this had was to idle down to a quieter state when not actively running water through it. But I really like the variable pressure, it just adjusts the engine's RPM's to control, but works well. It has started on first or second pull every time I've started it and runs pretty smooth. I'll use this this spring to clean the driveway and back deck, but about 99% of it's life will be spent washing cars. We've got e and I like keeping them clean. I can't speak for reliability or durability long term but so far with it I would buy it again and highly recommend this model. Rated 5 out of 5 by Blake1132 from Very versatile compact unit for every home owner I live in a neighborhood that is always hiring pressure washing companies to clean the sidewalks and roofs. This unit has almost paid for itself in one year. In Florida the mold builds up fast and with the Generac pressure washer clean up is a breeze. I would highly recommend this product to everyone. Rated 5 out of 5 by DD from One Wash The one wash works great. I use it with a concrete cleaner attachment. Rated 5 out of 5 by EastCentralKansas from Great power washer Bought this washer and read instructions completely. I pulled the starting cord and it immediately fired up and ran as expected. I started and stopped the unit several times trough the project, with the engine starting on the first pull each time. Pressure was adequate. Easy to move, but yet stable during use. Only complaint deals with the detergent hose. The instructions ever show or describe the need to install it over the barbed connection near the water hose. Also routing the hose away from the muffler is in the instructions but installation of two clips to properly route the detergent hose would be a good addition. Rated 5 out of 5 by MowingFool from Can't wait to finish! I bought it to late in the year to clean everything but I was able to test it on my driveway, sidewalks and stone retaining wall. It cleaned everything better than I expected. You can really see the contrast between what I did and did not do. Even with the manual start, having to move the unit because of the hose length was no problem. It was no worse than my lawn mower. Two things to be careful about. Don't get the soap hose to close to the engine, I did and burned a hole in it but it was easily patched. I also did not properly secure a nozzle and it took me a while to find it after it shot out. One more thing, I wore mud rubbers and I should have worn boots. I can't wait for spring when I can finish. Rated 4 out of 5 by Pat010bradley from Great features all around Runs very smooth. Love the adjustable psi settings. It just delivers just as advertised! OneWash Residential 6602 is rated 4.7 out of 5 by 391. Maximize your investment and maintain your Generac power washer with a variety of accessories.